Simplify your life with this ultra sophisticated device. You can use it to take still photos and make video and audio recordings of lectures, meetings and more. 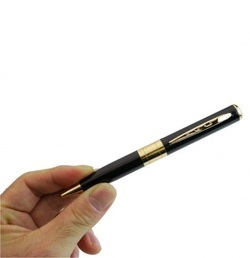 Instead of limited internal memory this pen features SD Card support for up to 16GB Micro SD Cards. Also works as a web cam. The unit switches easily between still and video modes, starts and stops with a single touch. Features next generation 720 x 480 resolution for extraordinary video quality.